A few days ago I shared with you what I look for at thrift stores. Today I thought I’d do a little switch and give you a list of things you should NEVER buy at thrift stores. Leave a comment and let me know what you would never buy! Swimsuits. Honestly, this is my personal choice. You’re probably not going to get a disease from wearing someone else’s underwear or swimsuit. I would just rather not be that close to some stranger. Shoes. Again, yuck… but again, I have broken this rule when I found a pair of Converse in my size that didn’t have much wear. But shoes conform to your feet as you wear them and used shoes fit someone else’s feet… not yours. Upholstered Furniture. Uh oh… I’ve broken this one, too. But I might not do it again. 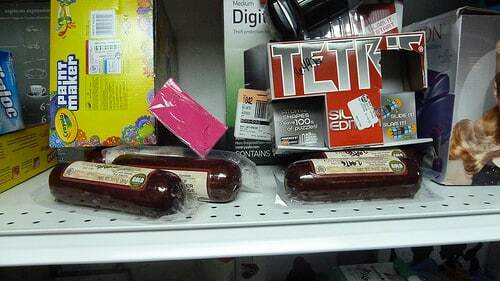 Even if you don’t smell anything at the thrift store when you get it home it might be a different story! And now with the bedbug scare that gives me another reason not to do it. But I probably would if I was going to tear the upholstery off and redo it. Mattresses. Bedbugs… ’nuff said. I’ve seen used bedding on lists before but I have bought vintage sheets for sewing projects and to use on our beds. I just wash and dry on the hottest temperatures and bleach when possible. Cribs. Safety standards change all the time and you want to make sure your baby is safe! I have some friends who have used the sides of cribs as displays. If you’re using the crib for something other than a baby, go for it. Car Seats/Baby Carriers. Besides safety standards changing, car seats are meant to withstand ONE crash. There’s no way for you to know if a used car seat has been in an accident or not. Keep your babies safe! Bike and Motorcycle Helmets. I didn’t realize that helmets were also made for ONE impact, too! No way to know so avoid them. Makeup. Bacteria live and multiply in makeup once it’s been opened. Medicine. 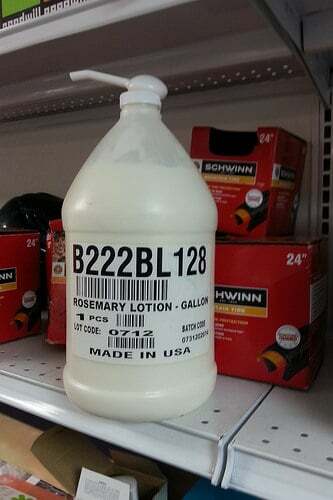 If you see medication in a thrift store it’s probably expired. And possibly opened or tampered with in some way. Food. Like the medication. Possibly expired or tainted. Kitchen Appliances. Old blenders, fryers, or kitchen utensils that might have touched meat or still have a greasy residue on them. Non-stick cookwear. The film breaks down over time and gets into your food. Plastic water bottles. There are two many areas in the straws or on sports caps that are hard to clean. Things that cost more than retail. I’ve actually seen that quite a few times! Know your prices or you might be tricked into spending more for something used than new. Here are some things that I find handy on thrift store shopping days! Thanks for reading! 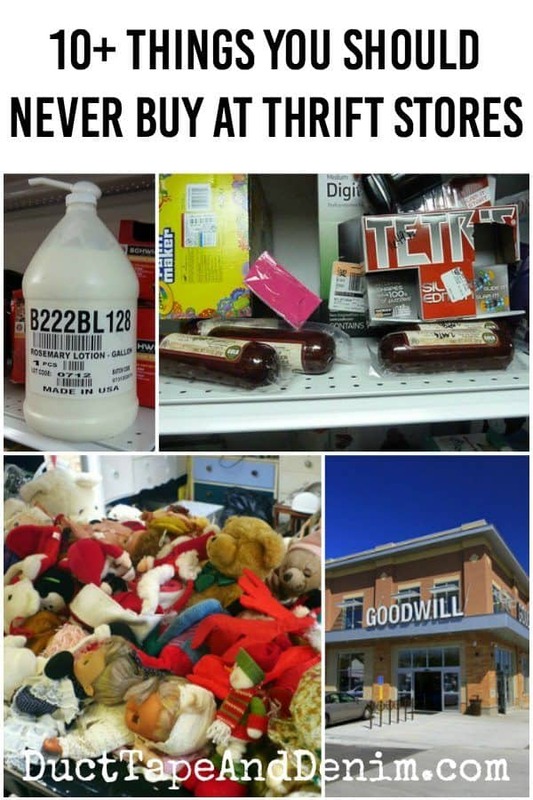 Leave a comment and let me know if I left out any things you should never buy at thrift stores. Great post!! Informative. Thanks for sharing. loved this post Ann! 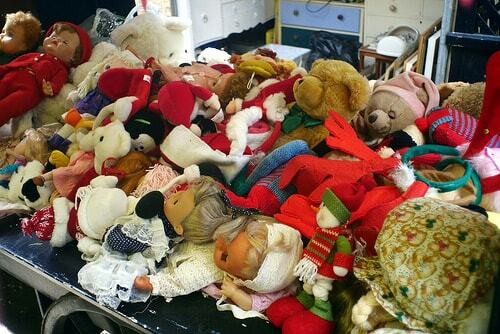 just thinking about all the bugs crawling around in those stuffed animals gives me the heebie jeebies! I love thrift store shopping, but you’re absolutely right – some things are just a no-go. I mostly look for clothes and – most especially! – books! You should like my post on Monday… it’s about buying CLOTHES at thrift stores! Thanks for the great tips. Virginia law requires that upholstered furniture must be cleaned and then treated with an anti-bedbug spray before it is put out for sale. I worked in an antique shop for 12 years. I did buy a sofa at Salvation Army over 10 years ago and it was perfect and the best bargain I ever found. We are still using it. That’s nice to know… I’ll have to check into my local laws. I think I mentioned in the post that I have bought upholstered furniture before. It was a couch, too. Then I’ve bought a couple of chairs that I reupholstered. Love the tips! Lately my biggest complaint is thrift shops in general are getting too greedy. You are correct, prices are higher than retail in many cases. I shop in a local thrift called Nsme Your Price. Although not everything is name your price, most things are, the prices objects are fairly priced. Great post. One question: I’ve bought newer looking stuffed animals before and always wash them in hot water when I get them home. I don’t know much about bed bugs. Now I’m wondering…….is that enough to kill bed bugs? Holly, Thanks for reading my post! Sorry it took me a while to get back to you. My computer died and I just got a new one today so I’m trying to catch up. I did a little research and from what I’ve found if you can wash them in hot water and dry them on hot that should kill bed bugs. Our local MCC store doesn’t carry most of those things anyway, because of health and safety regulations (such as food, cosmetics, baby cribs, helmets). They do sell shoes, furniture, etc. ; it’s your choice whether you want to take a chance on them. I’ve bought shoes (cleaned them first) and never had a problem. Wow, I agree with the underwear, but to be honest you are supposed to wash the clothes you buy, so if you’re concerned about germs, wash them again. To me it’s all paranoia. I have always gone to yard sales and second hand stores, that’s how you stretch money. I buy appliances, cookware and stuffed animals at our goodwill. I have saved thousands over the years buying things for my kids for Christmas. Many things still having new tags on them. I am squeamish about certain things, like sharing helmets, but honestly, bedbugs are something I’ve not really concerned myself with. Interesting post. Yeah, I don’t really worry about bed bugs. You just wash things well in hot water! I always wash anything I buy at a thrift store, especially if it’s a textile. I don’t really know where all this bed-bug fright started but if you don’t live in rat-infested slum I don’t think there’s much to worry about. Now, lice–that’s a different matter. They don’t carry disease but they can itch you to death! What about buying electronics at a thrift store? Even if you can plug them in and they seem to work do you think it’s still a gamble? I know what you mean about lice… we had an episode when my girls were in little league and were sharing baseball helmets! I don’t really buy many electronics. I suppose if they were a good price I’d take a chance. I do have a friend who reworks lamps. Maybe I should get her to do a how to project for us. Never buy bra’s and hat’s.